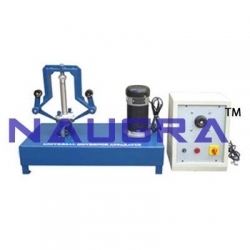 LabEquipmentsManufacturersIndia is a renowned theory of machines laboratory instruments manufacturers, suppliers, and exporters in India. We offer a comprehensive range of theory of machines lab instruments to various engineering institutes, colleges, universities to educate students and perform their tests and experiments easily and safely across the globe. We are supplying high-quality theory of machines laboratory equipments around all over the world at very competitive prices. Some of our theory of machines lab equipments are torsion vibration apparatus, solar gear apparatus, universal vibration system, governor apparatus, gyroscope, centrifugal, coriolis force demonstrator etc.